At the bottom of the Garden: So excited! 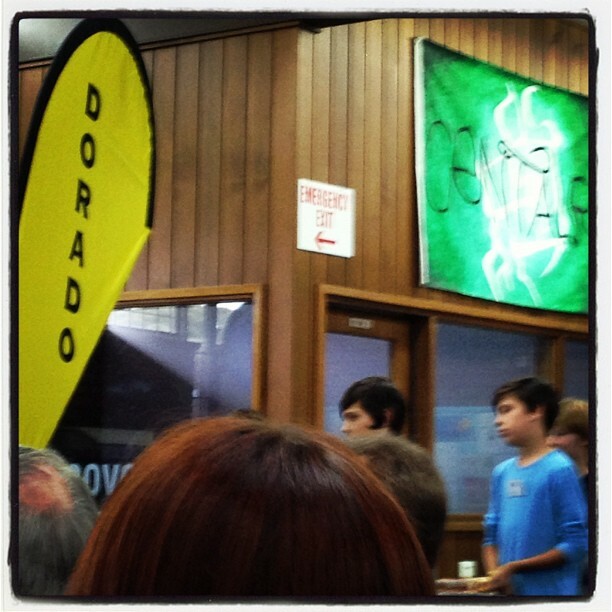 Today was the 'Meet and Greet BBQ' at Erik's high school! Every time I go to this school I'm impressed! 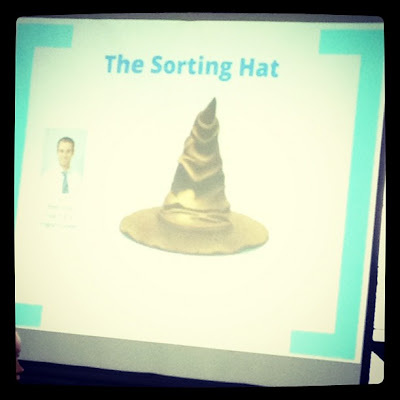 There was a sausage sizzle followed by a brief introduction about year seven curriculum, and then the children were sorted into their school houses. There are six houses, all named after constellation. I knew five of them (Aquila, Centaur, Orion, Pegasus and Phoenix), the one Erik actually got into I didn't know - Dorado - apparently it's a constellation above the Antartic. That house's colour is yellow. There was an introduction to each student, basically stating their interests and from that we discovered that artists are not particularly common, only two or three besides Erik. lots of kids listed Minecraft amongst their interest and most of those ended up in the same house as Erik - so he'll be very happy with that. One student was also into Art and Doctor Who and is in the same house as Erik, woot! Apparently none of the kids in his house went to the same primary school - which I think is pretty good actually because it means they all start out on a similar footing. The students went off to do 'team building exercises' - Erik reported back that it was some sort of treasure hunt - and we, the parents (and mostly bored siblings), listened to a speech from the principal on the school's educational philosophy and approach. I am always so very impressed with this principal. Probably because so many of his views are identical to my own. But he is also humble and said, amongst other things, that he is always open to discussion about anything that goes on at the school because, 'We don't always get it right, implementing a new approach can be messy.' He also said, he felt parents should be highly involved and included in their child's education and that this high school did 'not treat parents as if they didn't know anything'. Yes! Love it! He outlined the education approach - which includes Australia's first ever school with over 100 students to actually offer individual learning programs to every student - and some of the innovations which are still in the pipeline. I asked him for a copy of his overheads after the speech and he will send them to me, but did ask I didn't make them public until the students of the school had had a chance to hear about the innovations - this is because students are consulted and all aspects and their feedback is taken very seriously into account. Student reps are on all school panels - including for hiring of staff - so student involvement is taken very seriously. I had to tell him I'd already tweeted some of his speech - oops! This made him laugh, I don't think he'd considered that possibility. He may preface future speeches by asking attendees not to tweet them! He didn't say as much, but I wouldn't be surprised if he was thinking it. 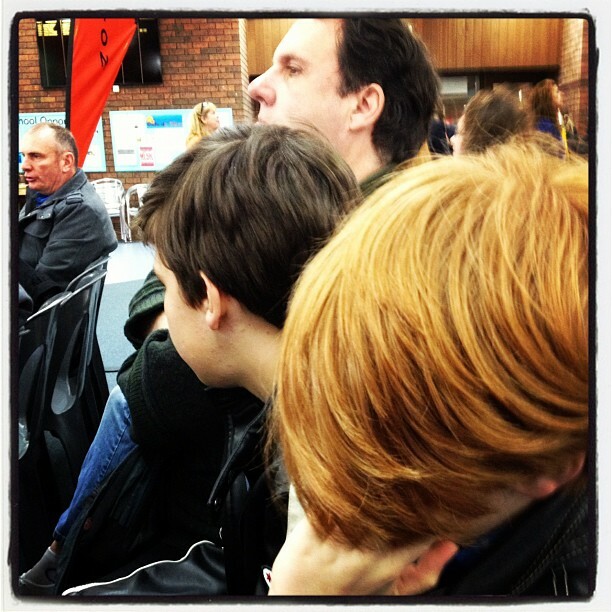 We still need to organise an interview for Lukas, who is set to start high school in 2014, and this time I don't want to be trying to get him in at the last minute! Hiding from mum's camera phone - because mum is soooo embarrassing! 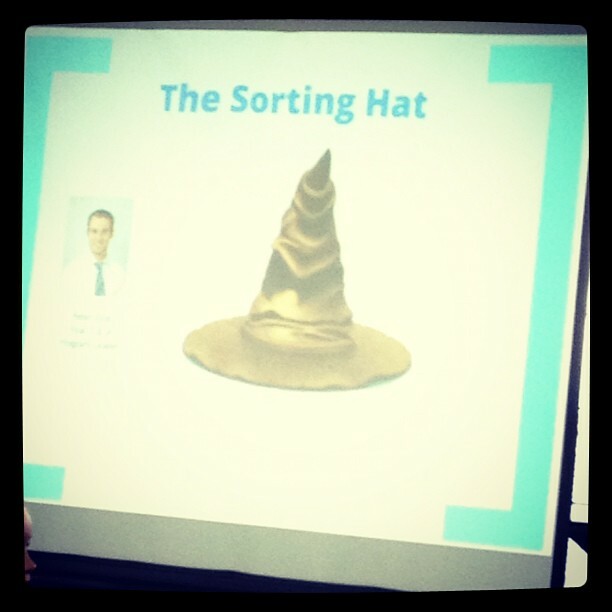 The sorting hat - got to love a school which references Harry Potter! where everyone can see him, but he did survive! Next appointment at the school is in November for the information night - cannot wait!